Seeing well made items being scrapped doesn't sit well with with us so we have decided to produce a limited collection made from salvaged pieces. 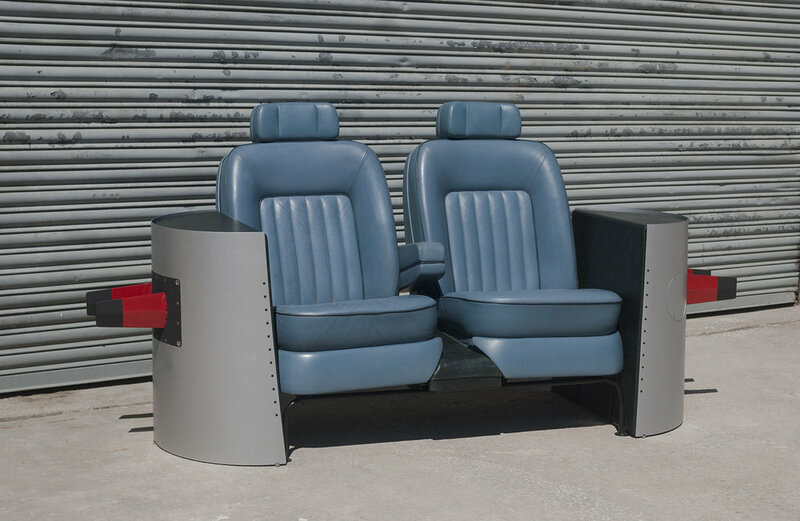 This seat is made using two1980’s Rolls Royce Silver Spirit seats and fuselage cowls from Tornado jet fighters which are lined with tactile dark green leather. This combination of pieces and our design skill have created a truly unique and eye catching piece. These lamps are ex-military search lights mounted on a custom made tripod. The Lamps are made available in both the original Military green paint or stripped back to reveal a peened brass surface underneath. Allowing the same light to fit a number of environments. The tripod stands are available in Black or sealed raw steel.